Cover, a photo by inesmergel on Flickr. Government Information Quarterly just published one of my articles on the adoption decisions of federal departments to use social media and how the decision making processes lead to online tactics. In 2009, the departments in the executive branch of the U.S. federal government received the presidential marching order to “harness new technologies” in order to become more transparent, collaborative and participatory. Given this mandate, this article sets out to provide insights from qualitative interviews with social media directors to understand the factors that influence internal adoption decisions to use social media applications, such as Facebook, Twitter, or blogs. Three distinct factors influence the adoption decisions of social media directors: information about best practices in their informal network of peers, passive observations of perceived best practices in the public and private sector, and “market-driven” citizen behavior. The resulting adoption tactics include: (1) representation, (2) engagement, and (3) networking. The findings point to the need for higher degrees of formalized knowledge sharing when it comes to disruptive technology innovations such as social media use in highly bureaucratic communication environments. Recommendations based on the lessons learned are provided for practitioners and social media researchers to develop social media tactics for different organizational purposes in government. Please email me if your library does not have a subscription for the article. Our paper “Co-Citation of Prominent Social Network Articles: The Evolving Can” was published by Connections in their current issue. You can download a copy from my publications page at Maxwell. Social network analysis has been a particularly hot area across the social (and some non-social) sciences. How has this growth, in turn, affected the field of social network analysis within sociology, the discipline which has served as the primary home of social network analysis over the last several decades? 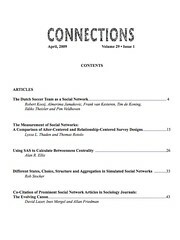 In order to answer this question, we examined the citation patterns of the social network papers in the two leading general sociology journals, the American Sociological Review and the American Journal of Sociology, from 1990-2005, focusing on the body of literature that was cited by at least two social network papers in a given year. We produced two network snapshots of the social network canon during this period. These analyses reveal a combination of great change and substantial continuity. There was a substantial increase in interest in social networks in sociology throughout this period, and, in particular, an enormous rise in interest in small world issues, coupled with the abrupt entry of mathematicians and physicists into the sociology social network canon. However, during this entire period Granovetter’s work remained squarely at the center of the canon, with Granovetter (1973) as the most cited piece at both the earlier and later snapshots. Is online social networking making us sick? The Institute of Biology, UK, has published a paper called “Well connected: The biological implications of ‘social networking’” (pdf file). In this paper, the author Aric Sigman argues, that the more time people spend online, the less they have direct contacts with other human beings. One of the most pronounced changes in the daily habits of British citizens is a reduction in the number of minutes per day that they interact with another human being. Recent history has seen people in marked retreat from one another as Britain moves from a culture of greater common experience to a society of more isolated experience. She is in good company, as Americans too step back from one another in unprecedented magnitude. Together with Timothy Huerta, Texas Tech University, and Jennifer van Stelle, Stanford University, I have written a paper on “How do networkers network?”. We conducted a study of participants at the annual conference of INSNA (International Network of Social Network Analysts) to understand how young researchers are introduced into the community of senior researchers. The paper is work in progress at the moment and we would like to hear your comments, especially on our methodology. This study was conceived during the 2005 INSNA conference by attendees who were interested in the evolving patterns of relationships among social network academics and consultants, and in how junior researchers were being integrated into the existing community. The study was also intended as a session- and space-planning aid for the 2006 conference organizers. Specifically, this paper describes a study of networking among social network professionals who attended the 2005 INSNA (International Network for Social Network Analysis) “Sunbelt” Conference. The attendees were asked to respond to two rounds of surveys regarding their experiences. We obtained data on existing and new ties in the first round of the survey, and tracked the maintenance or decay of those ties in the second round (approximately nine months later). We employ homophily arguments as well as theories of status and career/life cycle to determine what factors led to the establishment of ties from interactions at the conference. We consider the content of the new ties in addition to the above-mentioned theories to understand why such ties decayed or were maintained in the post-conference period. As well as applying the results of this study to the understanding of social network dynamics, we hope our findings will further the integration of new members into the existing community and enhance the session-scheduling and space-utilization aspects of conference planning. I am pulling together different ideas on how to give helpful feedback as a discussant or reviewer of other people’s work and am starting a list here. Helpful comments are more than welcome and will be added to the list! Role of the DiscussantThe discussant should state the key point or thesis of each paper, mention the major points, reasons, innovation, or evidence that support the overall argument and assess the papers in terms of the major theme of the conference. Further, to stay within the spirit of this multidisciplinary colloquium the discussant should prepare questions that stimulate fair, open, and inclusive discussion. Chair / Discussant guidelines– Arrive at the session room at the latest five minutes prior to the scheduled starting time and introduce yourself to the presenters.- A room attendant has been appointed to every session room. It is this person’s responsibility to take care of the audiovisual equipment and to assist you and the presenters at any time. This room attendant will introduce himself/herself to you at the start.- Inform presenters of the maximum of time they can use for their paper presentation. This time has been fixed to 15mins and includes a 5 minute question time. A 15min discussion slot has been allocated at the end of every session (these typically include 5 papers) . Introduce the orange and red card system to them (see below).- In introducing the session – please be brief – tell the audience how many papers will be presented, how long each presentation will be and when there will be time for questions.- For each paper, introduce the author and the title of the paper.- In order to facilitate time management of the presentations, a set of orange and red cards will be at your disposal. Show the orange card to the presenter when 5 minutes presentation time is left. Show the red card when time is over.- In managing the question-and-answer-time, please ask questioners to identify themselves and to keep their comments as short as possible to allow the presenters to respond in full.- Please ensure the session to finish in time. Sessions that overrun will affect next sessions.- In case you are presenting a paper yourself during the session you are chairing, we strongly recommend that this be done at the end of the session, even if this means altering the formal programme slightly. The efficient management of the session will benefit from it. When presenting your paper ask one of the other presenters to manage your time using the cards. Guidelines for Discussants APPAM also sends a detailed letter to all session discussants by early September of each year. This letter informs the discussants of their responsibilities, and also provides them with basic information about their sessions. It reminds them of time limits, and adds these further points: Discussants are encouraged to make integrative comments rather than paper-by-paper critiques. In many cases, very specific or detailed critics can be shared with paper authors outside of the session. Discussants should, if possible, contribute to the policy focus of the session. In general, discussant remarks about each paper should deal with the major issues that enhance or undermine the paper’ contributions, reserving minor issues for direct communication with the authors. Is the empirical “transformation” adequate? Is there a red line in the paper / logical structure? providing suggestions for improvement along those lines.If you have to discuss several papers, an obvious addition to the above would be to compare the papers.